Originally published by City Plaza Refugee Accommodation and Solidarity Space Facebook page. Struggling for a dignified life is a right, not a crime! City Plaza Refugee Accommodation and Solidarity Space announces its support and solidarity with the 35 asylum seekers from Moria Refugee Camp, Lesvos, unfairly arrested following a peaceful protest on 18 July 2017, and with the 8 asylum seekers of Petrou Ralli detention centre, awaiting trial after being subjected to extreme police violence when attempting to speak to the centre’s director about their detention conditions. On the second day of a protest by hundreds of residents of the Moria hotspot in Lesvos, the Greek police brutally intervened using tear gas to disperse the peaceful mobilisation. The intervention was so violent that Amnesty International and other Human Rights organisations immediately issued a statement condemning the excessive use of force by the Greek police. 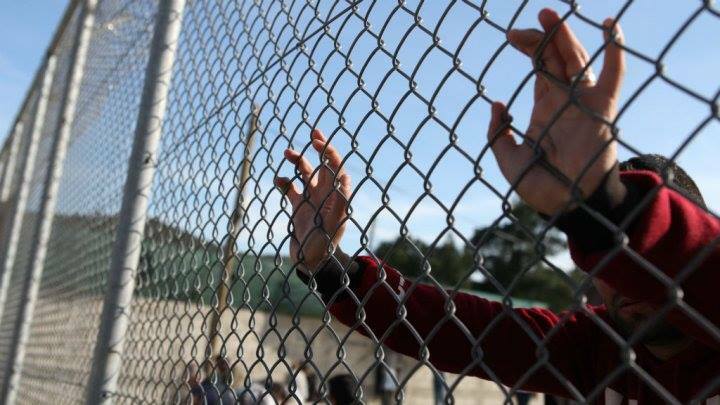 The police subsequently raided the African section of Moria, where living conditions are the worst across the camp, and selectively arrested 35 asylum residents known for their attempts at voicing opposition to their inhumane detention conditions. They have since been imprisoned (in Chios and Athens) awaiting their trial set for 20 April 2018 in Chios. According to the Legal Team representing the Moria 35, some of the defendants were not even participating in the peaceful protests, nor were they present when the police intervened. The Moria 35 have been all subjected to the same charges, which include arson, resisting arrest, attempted assault, rioting, damage to private property and disturbing the public peace. This implies that these arrests were performed in order to intimidate refugees and prevent them from speaking out against the conditions in the camp, rather than on the basis of individual actions by the defendants. These trials are not only unfair: they are used as exemplary punishments in order to deter other refugees in Moria to contest the terrible conditions in the camp. This situation has been continuously denounced by the Free Moria 35 Campaign which highlights the unfairness of these arrests and the use of brutal force by the Greek police. City Plaza Refugee Accommodation and Solidarity Space also denounces the unjust arrest of 8 asylum seekers in Petrou Ralli detention centre. On 31 May 2017, refugees detained inside the centre asked to speak to the Director in order to be informed about their detention process. Rather than granting them this request, Greek police on site staged a violent attack against the detainees, which resulted in several hospitalisations. In order to cover up their unjustified brutality, the police officers involved in the attack fabricated a case against the refugees, claiming that they were attempting to escape from detention slipping and hurting themselves while doing so. They have since been in prison awaiting their trial on 27 April 2018, in Athens, on charges including resistance to the authorities, attempted assault and carrying dangerous objects. The Moria 35 and the Petrou Ralli 8 are being punished for resisting the horrible conditions created by Fortress Europe and for contesting a border regime based on systematic detention and the signing of deals aimed at detaining refugees indefinitely in inhumane borderzones such as Lesvos since the EU-Turkey deal. These trials are part of a larger strategy that intends to silence and erase the dreadful experiences of refugees, as well as their political struggles for justice and their right of movement. City Plaza stands in solidarity with refugees of the Moria 35, the Petrou Ralli 8 and all the refugees fighting for their rights! We call the solidarity collectives in Greece and in Europe to stand with refugees of these two important trials, on 20/04 in Chios and 27/04 in Athens. Solidarity action: Support the mutual aid work with reugees on the Balkan route of the Cars of Hope collective. Order a t-shirt here. Or donate (details in the text on the right). In a few days a Cars of Hope team will be on Lesvos again to work together with refugees on the Greek island. They will provide mutual aid. Next post: #NoG20 #Hamburg, Germany: Freedom for Peike!